Please browse these categories to find the topics that interest you. Clicking on a subcategory will link you to a list of course titles in that subject area. From there you can go to individual course descriptions and classes. Important: Click on link(s) below for the appropriate information and forms. ed2go, in partnership with Mt. 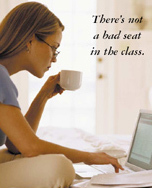 San Antonio College, offers a wide variety of online classes. Take the classes you would like, when you have the time to take them. You can take any of these classes in the convenience of your own home or office. Mt. San Antonio College, Community Education Department acts as a pass-through/referral partner with ed2go. This partnership enables ed2go to outreach to Mt.SAC students and offer online learning. ed2go is an industry leader in online learning delivery. ed3go, in partnership with Mt. San Antonio College, offers online open enrollment programs designed to provide the skills necessary to acquire professional level positions for many in-demand occupations. Mt. San Antonio College, Community Education Department acts as a pass-through/referral partner with ed2go. This partnership enables ed2go to outreach to Mt.SAC students and offer online learning. ed2go is an industry leader in online learning delivery. 1100 N. Grand Ave. in Building 40, Room 101 (enter campus on Bonita Avenue off Temple Avenue). The programs chosen to be included in Mt. San Antonio College's Community Education Fee Based Offerings are selected because of unique interest to the community, and offer enticing perspectives on interesting subjects. All of our instructors are interviewed and selected for their confidence in their subject and their willingness to share their expertise. We welcome input from the community. If you are interested in teaching a course, please go to the teaching page for more information.